Bonnie Jane (Nance) Jackson, daughter of John Wesley and Enda Mae (Welch) Nance, was born on August 19, 1921 at Blanchard, Iowa. 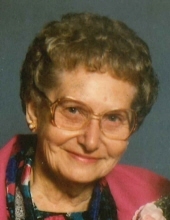 She entered into eternal rest on Wednesday, November 14, 2018 at Elm Heights Care Center in Shenandoah, Iowa, at the age of 97 years, 2 months, 26 days. Her early life was spent growing up in the Blanchard, Iowa area before moving to Corning, Missouri for one year and then the family moved to Broken Arrow, Oklahoma for short time, eventually returning back to Blanchard, where Bonnie played high school basketball. She graduated from Blanchard High School with the Class of 1940. On April 25, 1942, Bonnie was united in marriage to Lloyd Coleman Jackson at Auburn, Nebraska. To this union nine children were born, Janice, Sharon, Jerry, Connie, Bonnie, Don, Mike, Randy, and Merrie. They resided in Northboro following their marriage for a short time. They later resided in Sharpsburg, Iowa and Villisca, Iowa, where all nine kids graduated. She and Lloyd then settled in Coin, Iowa where Bonnie has spent the last 46 years. After the children were raised, Bonnie worked at Clarinda Mental Health in Clarinda, Iowa from 1964 until her retirement in 1982. She was an active member of the Coin Methodist Church, serving on the Methodist Women's Circle. Bonnie had also served as a 4-H Leader, was a Coin Betterment Committee member along with Lloyd, a member of the Federated Women's Club of America (serving as president for several years) and also served on the Coin Library Board for several years. A wonderful cook, Bonnie loved to collect recipes. She was also a very gifted quilter and gave each of her children two quilts and one for each of her 21 grandchildren. She was also an avid reader until her eye sight failed. Gardening was another love of hers, most years she would put up over 200 quarts of each vegetable grown in her garden. She was known by her grandchildren as the "Jelly Grandma" and made sure that each of them received their favorite jar of homemade jelly for Christmas each year. Preceding Bonnie in death were her parents; husband, Lloyd in 1999; daughter, Sharon Vianelli; three grandsons, Dustin Jackson, James Sunderman and Colby Mann; sister, Letty Clark; brother, John Nance; and two sons-in-law, Seymour Gray and James Dake. Left to cherish her memory are her children, Janice Willett and husband Donald of Corning, IA, Jerry Jackson and wife Susan of Henderson, NV, Connie Dake of Des Moines, IA, Bonnie Gray of Des Moines, IA, Don Jackson and wife Phyllis of Storm Lake, IA, Mike Jackson of Villisca, IA, Randy Jackson and wife Peggy of Laurie, MO; and Merrie Jackson of Omaha, NE; son-in-law, Gene Vianelli of Essex, IA; 21 grandchildren; 41 great grandchildren; 10 great-great grandchildren; many other relatives and friends. Funeral services will be held on Monday, November 19, 2018 at 2:00 pm at the Nishna Valley Funeral Home with Phil Wing officiating. **** PLEASE NOTE THAT LOCATION OF SERVICE HAS CHANGED**** The family will greet relatives and friends with visitation from 4:00 to 6:00 pm Sunday, November 18, at the Nishna Valley Funeral Home in Shenandoah. Burial will take place in the Blanchard Cemetery. Memorials are being directed to the Coin United Methodist Church or to the Coin Public Library in Bonnie's name. The family will greet relatives and friends with visitation and viewing from 4:00 to 6:00 pm Sunday at the funeral home.